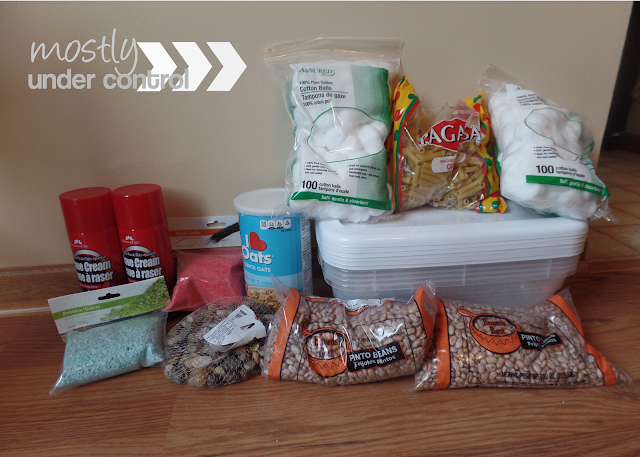 6+ Sensory Bins for under $30 – with tons of other ideas! 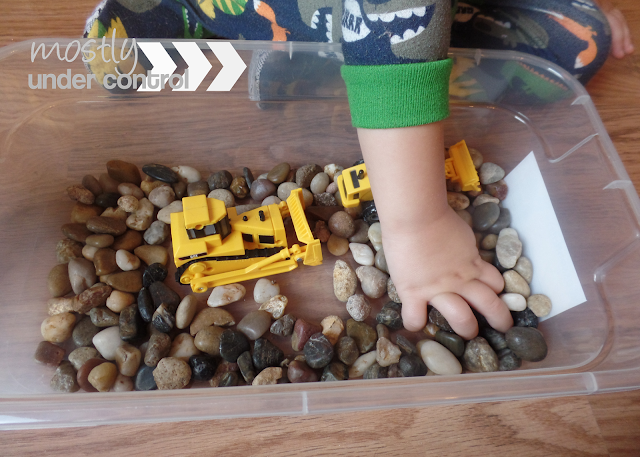 Sensory bins are the best for keeping small hands busy. You can switch out all the “fillers” and create tons of different combinations! 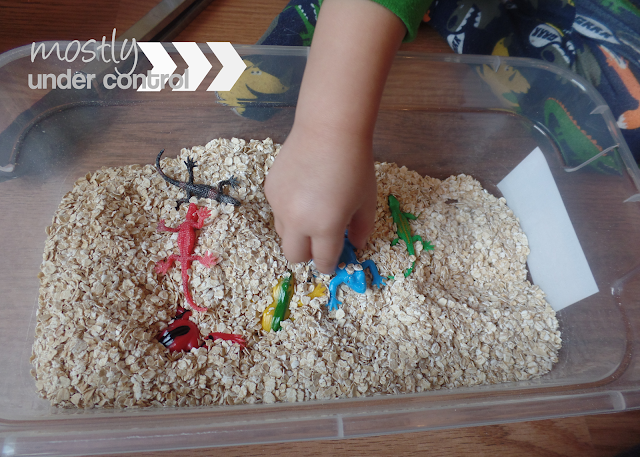 Sensory bins are so versatile and are perfect for all little learners. Check out all of my sensory and activity posts here. D needs sensory stuff and sensory bins. And since we are inside, waiting for baby to arrive, I knew he needed a sensory bin day. So first I am going to show you the 6 bins that I made, then I will give you ideas for the “+” bins. 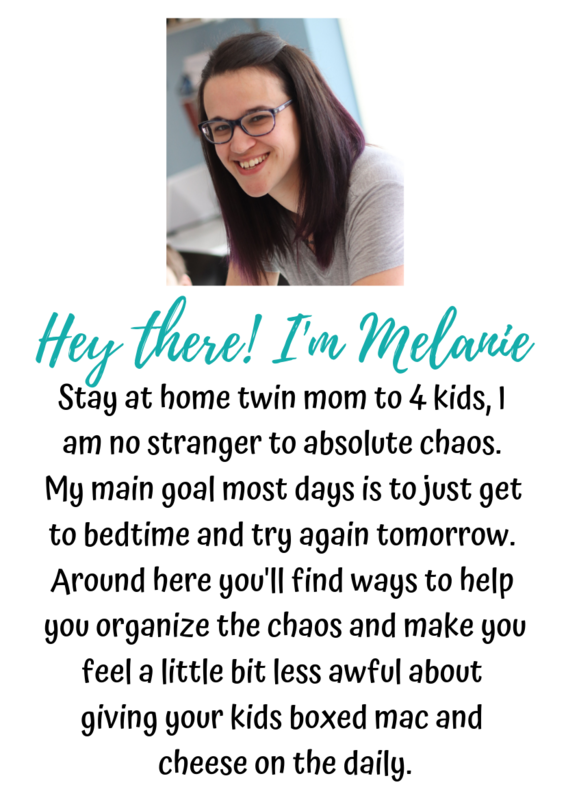 I will have to run to the Dollar Tree again and pick up 1 or 2 more bins that will act as “messy bins.” The bins that need to be switched out and can’t hold certain stuff (ie, clean mud, shaving cream, water, etc). I let D pick out which toy he wanted to put in this one and he chose the creepy crawlies. In true boy, sensory seeking fashion, he could not WAIT to get his hands in there. His imagination went wild with this one. They were all on a mission together to save the good guys and fight the bad guys! Kids can learn colors, numbers, get their sensory output fix for the day, whatever. Next one was the rocks and D actually had the idea of what to add to the rocks. I have to admit, those construction vehicles were not purchased at the Dollar Tree. But how could I say no, when it was his idea to toss them in after seeing the rocks? I just couldn’t. Next, we loaded up the bin with dry oatmeal. You could very well use wet oatmeal, but don’t reuse it. You would have to toss it out after you played with it but I bet it would be very fun. I was going to write numbers under the creatures bellies but there just wasn’t enough time with this guy digging in. Next up was beans! I don’t know why, but beans are my favorite sensory item. Maybe it’s because it was one of the first that I used when I was a developmental therapist? They are heavy but not too heavy and they’re cold. I even like playing in the bean bin! We added the toy kitchen utensils and a scoop in this one. D loves the kitchen utensils so he enjoyed this bucket. 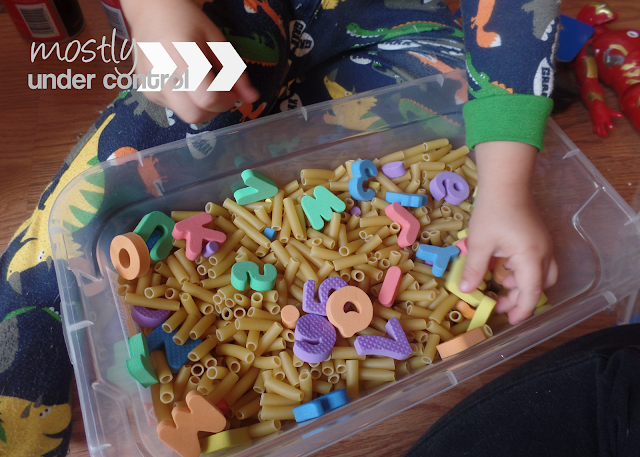 Finally, we did dry pasta and a mini foam board I found that he could put the letters into. I love this one! We are trying to learn the difference between numbers and letters and this one is awesome because it has letters and numbers. *Shaving cream is also awesome and will be a part of the messy bin. *The toothbrushes will be in a soapy water messy bin with his cars so he can wash them. *The funnels can really go into any bin. D found a home for them in the oatmeal bin! I also share lots of easy, educational activities in live videos on my Facebook page, so head over and give it a “like” and make sure you turn notifications on! The opportunities for sensory play are ENDLESS! 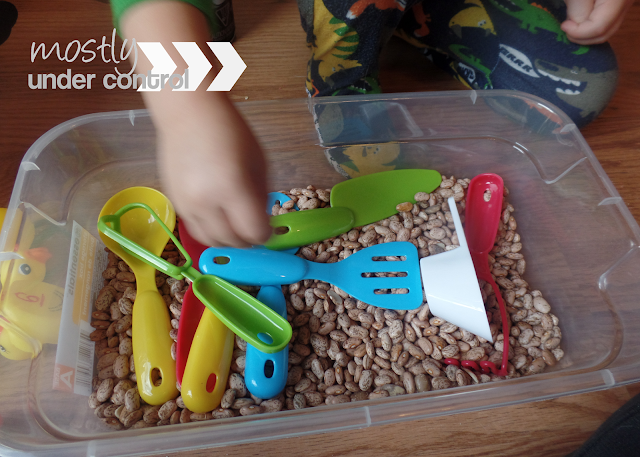 You can also add any small plastic toys really to these sensory bins. I could go on for hours on sensory activities. Please feel free to ask questions about sensory bins and activities. It was my FAVORITE part of teaching. I work with children as B.H.S. many having sensory needs. I found flatter containers with locked lids at big lots 4″deep by 12″long 8″wide. They really stack well in my in the back of my car. 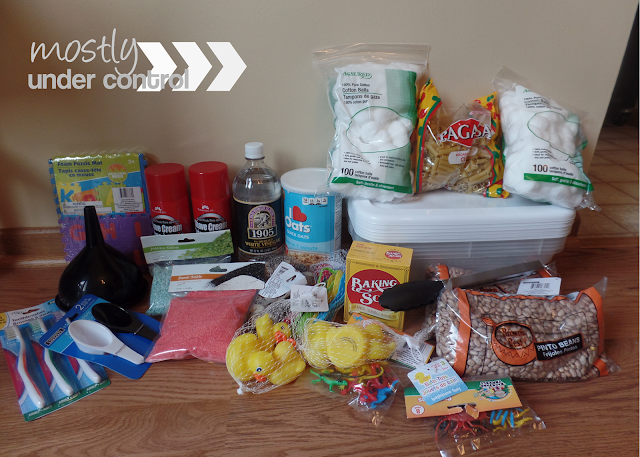 I also used dollar store finds in them……rice w/ measuring cups &set measuring spoons, green sand and fairies and a few fairy decor items (from big lots), white sand with frozen mini figures, water beads clear and a box of growing your own bth from dollar tree. 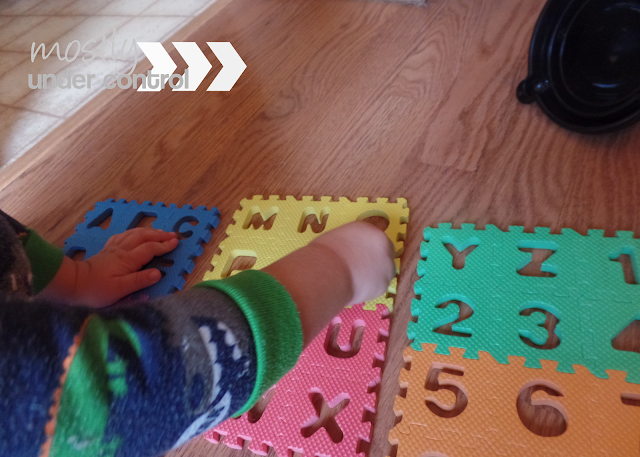 Like you it provides sensory play while economical. I also have one filled with kenetic sand and mini molds that I used 50%and 60% off coupons to keep cost down. I love this idea!! Would they be suitable for a 26 month old? 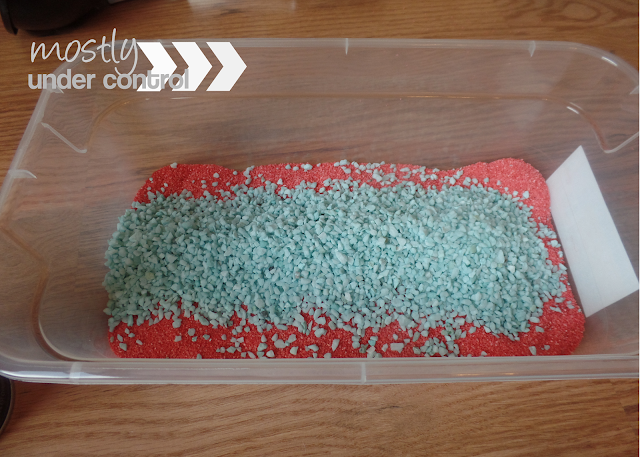 Love your ideas with the sensory bins. I teach Kindergarten and these would be awesome for my kiddos. Thank you! Awesome! They will love it! I might reading your wonderful post. My 3 n half year son is borderline high functioning autism with sensory issues. I have a 1 and 2 yr old. Any ideas on how i can keep clean up to a minimum with this activity? I usually have my kids play with it on a towel! Sensory bins are one of my favorite tools to engage and stimulate students. I always have some sort of containers on the side to sort or collect items in. Great ideas! Thank you! 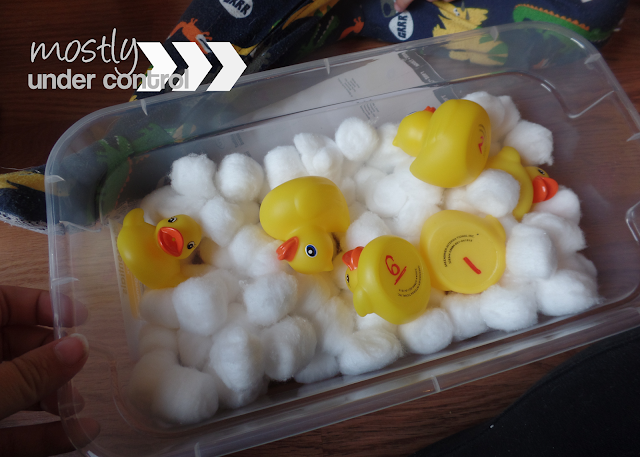 With the numbers on the bottom of the duckies, what activity did you do with them? I’m working on number recognition with my 2.5 year old. Thanks!! I am going to be teaching in an early childhood life skills room (3 – 5 years old) next year after being a 2nd grade teacher for 9 years! I am looking for these type ideas! Thanks! There are great ideas! I too am starting to teach 3-4 old and will be doing these! I was wondering how to do these in a classroom setting do you do one bin and kids rotate using it or 2 at a time? Not quite sure how to do that any suggestion would be wonderful! Thank you! I love these ideas. I teach special education and these bin ideas will be a great addition to my classroom for my younger grade students. Thanks for sharing!! I am so glad you find them helpful! I never knew this was a therapy approach but I have been making plastic shoe boxes of themes.So far I have made a seascape “sandbox” with shells, small plastic sea creatures, sand, rocks and some blue flat marble-like gems for “water”. My next idea is to do woodland Box with some woodland animals, plastic plants, sand or some sort of “dirt” item and some different sized pieces of branch cut into “logs”. Then another spin off of that is to just cut up various slices of tree discs from different trees with the various colors, bark, rings, sizes, and weights and sand them down and maybe put them in a wood box of some sort which can double as a play space to stack them. Other themes might be insects, fake leaves, branches etc. These are more playscapes but similar idea. My granddaughters ask to come play with their “sandboxes” all the time. All of that sounds so cool! 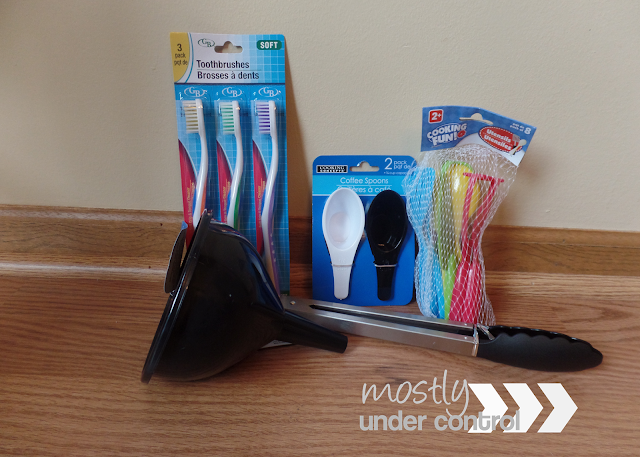 Thanks for these awesome ideas and economical finds. 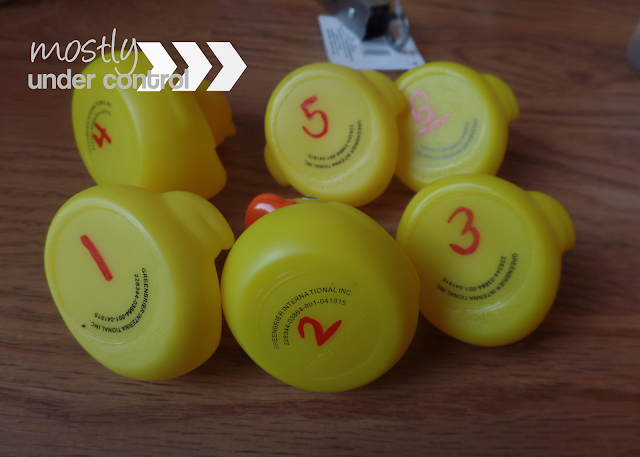 With a class of say 12-14 how would you organize/ schedule your sensory bins to accommodate that number of children using them at one time and/ or as I have my classroom set up into centers, would you simply make it a center activity? What sensory bin would you assign to what specific academic center if at all? We have a sensory table (sand/water) that accommodates 4 kids at a time. We just use larger quantities of the materials. Our kids are free to move to whatever interests them as long as there is space and they clean up after themselves. Usually whatever is set up in the sensory table is left out for a week. Water and other wet materials have to be cleaned out at least once a day. Shaving cream is a big hit, but unfortunately Michigan outlawed it a year ago. It can be a “learn as you go” kind of thing, really. Kids like to direct their own play, and that’s ok! See where they take it! I love these ideas! I have a three year old and went shopping today for this. I wondered if the “dry” bins with beans and macaroni need to be cleaned out after each use or can they just be covered and stored? I keep a lid on my dry bins and have had some for years. I have a daughter with sensory integration disorder. She is 14 but this will be awesome for her! Thank you for sharing!! Thanks for your inspiration! I feel a trip to Dollar Tree coming on. 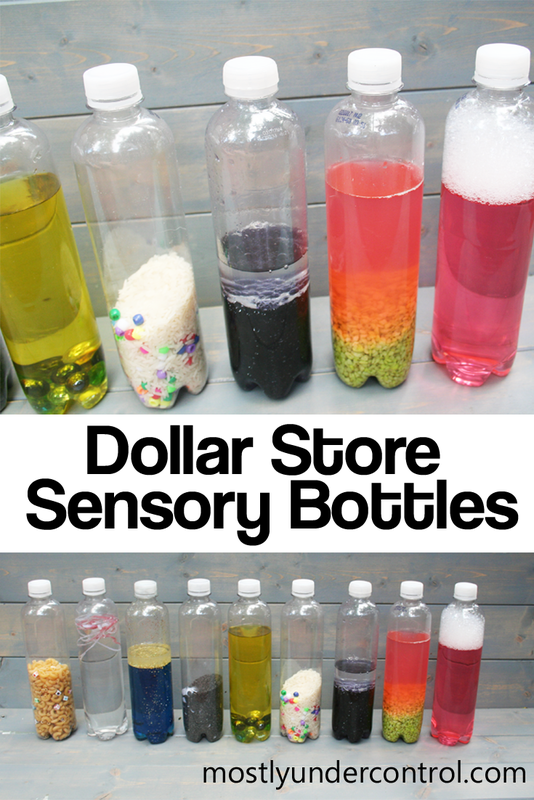 I work with 2 and 3’s and have been looking for something different for our sensory box. Ours currently has rice in it with construction vehicles. When I first set it up, I dyed the rice brown to look like dirt. (I know, they do sell brown rice). I do hesitate on beans and rocks since they so nicely fit into ears and up noses. I’ve also used paper shreds in my bug/lizard box. Thanks for the ideas! Hahaha – yes, they do fit nicely up noses and ears so that may be difficult in a classroom setting. Amasing ideas!!!! Thank you for your work! I use a plastic tablecloth under the bin. The kids have more space to get comfortable. I, too have resorted to using larger, flatter contsiners. I throw in tongs and chopsticks to build fine motor skills. So far the favorite base is lentils and kidneybeans. They love to run their hands through the beans, as they have a silky texture. How do you keep them from just dumping all the contents out of the box? Please remember raw kidney beans are poisonous do not use them with children. I love your bin ideas!! 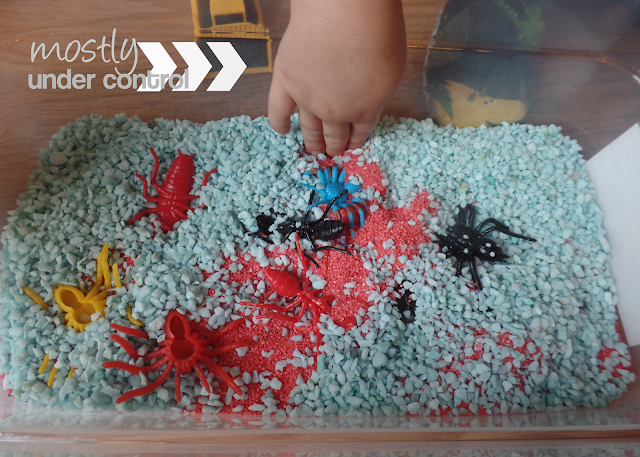 Do you you have any sensory bin ideas for a 16 month old. I have a 3 yr old grandson who is high functioning autism with sensory issues. Can you send me the same email you sent Deepshikha so I can learn how to use the bins to teach, play and have fun with him. Thanks so much. I really love these sensory bins. I haven’t thought about using oatmeal before for something like this. 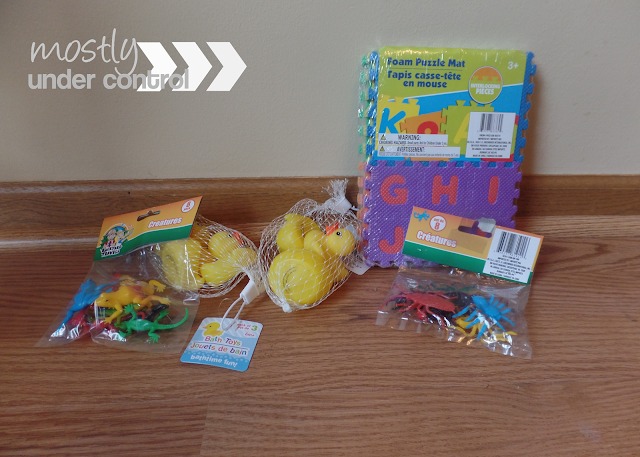 The fact that you can get everything from the Dollar Tree is just an added bonus!